Follow the Finnish delegation in Athens! The 66th International Session of the EYP started three days ago in Athens, Greece. Finland is represented by the delegations of Sammon keskuslukio, Tampere, and Gymnasiet Lärkan, Helsinki. Furthermore, Hanna Ollinen is a chairperson at the session, and Sini Ventelä and Alex Proctor act as journalists. We started our 3400km journey to Athens at the Tampere bus station at 5.30am on Friday morning. We were really excited about the thought that during the next ten days, we most propably wouldn’t need to deal with snow or minus degrees. However, it was still freezing in Finland, and there was snow on the ground as our plane left the Helsinki–Vantaa airport. In the plane, I got to sit next to Emma Mäki-Kala, and we had really good conversations about our topics – until both of us passed out. And we weren’t even under the influence… Way to go Finnish youngsters! Our flight was okay, and as we landed at the Zürich International Airport, we were actually 10 minutes ahead of the schedule – the beginning was really promising. After the connecting flight to Greece, the plane landed, and as we came out, there was a lady with a sign screaming EYP already. It was pretty easy to start networking with delegates from other countries right away: it turned out that we had been on the same flight as the German delegation. Unfortunately, our train connection to Corinthias was delayed, and we had to wait for about an hour and a half at the airport. At this point, our journey had already lasted for 12 hours! Our final bus connection was also late, and we arrived at the Sport Village – the venue for the first few days of the session – around half past nine in the evening. The camp locates some 50km from Athens and is rather large: there are about 35 cottages here. We share one cottage with ten other delegates, which is a great way to get to know other people from different countries. I am personally really satisfied by the atmosphere of the International Session so far. The people are just as openminded, happy and outgoing as they are supposed to be – this is EYP after all. I am sure we are going to have a great session, and I am really looking forward to the next ten days, especially the teambuilding that is going to start on Saturday morning. Committee on Security and Defence, here I come! In the following, Hilpi Luukkonen and Benny Eklöv reflect on their experiences as teachers at the session. After a fairly challenging and eventful journey we finally reached our destination: the sportcamp in Loutraki, about 75 km west of Athens. On the first morning, we spotted committees launching their teambuilding activities around the spacious sportcamp premises. Activities included games, problem-solving activities, dancing and singing among other things. However, teambuilding was not only limited to the students – all the 33 teachers also had an opportunity to do the same in order to learn each other’s names and to get to know each other better. One of the most memorable occasions so far was definitely the Eurovillage. Delegations from all the participating countries had brought food typical to their region and invested time and effort in putting the culinary delights on display. Having participated in several Eurovillages before, we both consider this one to be a highlight. It certainly enforced the group spirit and a feeling of community for students, organisers and teachers alike. The organisers have really worked hard on making the teachers’ program entertaining and interesting. We have been taken on excursions around the Peloponnese, visiting ancient Corinth and the over 2000-year-old amphitheater in Epidavros. 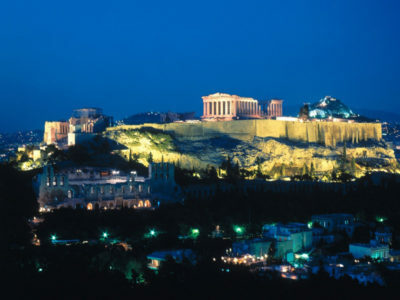 Furthermore, a guided tour around Acropolis as well as a visit to the New Acropolis Museum in Athens were also on the itinerary.